We’re one-to-one with technology for the first time; every little darling has a school assigned Chromebook. I’ve been experimenting with new tech tools… but that’s another post for another day! I have a new trailermate. My dear friend and colleague Paula retired and there’s a new teacher sharing my Portable Sweet Portable. I miss Paula terribly but I am delighted to welcome Amy back to DHS. She was my student in Spanish 2 and 4 years ago and now we’re colleagues. How cool is that?! Our department totally reworked our grading policies and philosophy to reflect the ACTFL proficiency guidelines. (Thanks for your help, guidance and Wisdom, Julie!) Our gradebook categories are now aligned with the 4 skills. I’m having fun digging into the 4 skills and thinking about how to assess them. A few nights ago I had one of those in-the-shower-moments-of-brilliance and I couldn’t want to try out my new idea. You guys! 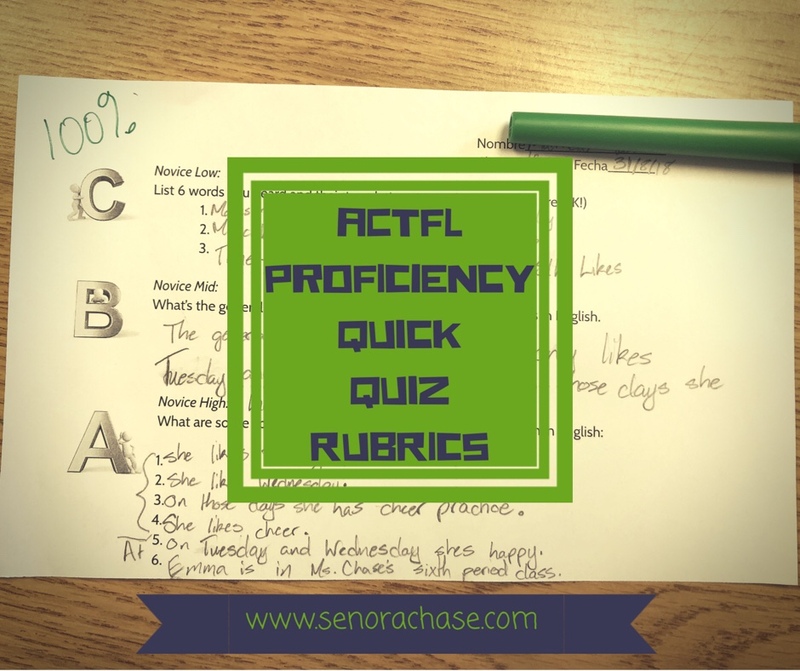 I think I’m really onto something: a super simple way to grade quizzes that are totally based on ACTFL’s proficiency guidelines. And that’s what I want to tell you about… so read on, dear reader, read on! So as a World Language department, we decided that: So in other words, if a kid is doing what Nevada says they should do in any given level, their grade should be a B. If they’ve progressed to the next proficiency level, they should earn an A, and if they’re not quite to the prescribed level, their grade should be a C.
This is a total paradigm shift for me…I used to grade reading and listening by asking comprehension questions: the kids who got them all right earned As, the kids who missed a few earned Bs, the kids who sorta kinda understood it earned Cs and so on. If you’d like to edit any of the documents above, just make a copy and knock yourself out! -What I love most about these is that they’re generic and you can use them with any listening or reading. You can have a stack copied and they’re ready to go when you are! You don’t have to write a new quiz every time you give a reading or listening quiz. Have a few minutes free at the end of the period? Give them a listening quiz! -The rubrics look suspiciously similar across levels…that’s OK! Obviously the listening sample or text is going to sound/look at lot different in a Level 1 class than a Level 4 class. Roll with it. -I tell my kiddos to start at the top of the quiz, then move down as far as they can. You can see below what an A looks like verse a B verse a C. I enter these as 10 point quizzes and enter the points to reflect the percentages. So 85% is entered as 8.5/10 Easy peasey! (Edit)One more thing: I’ve been using these a lot the past month or so and I’ve gotten a lot of feedback from readers who have been using it in their classrooms also. Every once in a while a kiddo will throw a curve ball and miss the main idea but nail the details! Or not fill out section C but fill out A and B! WHAT TO DO?! Don’t stress!! In my mind, if they complete 1 out of 3 sections that’s a C, 2 out of 3 is a B and 3 out of 3 is an A. And remember you’ve got freedom in the grade. The grade should reflect how much they showed you they understood. Maybe they wrote 6 basic details but they didn’t show you excellent comprehension- that can still be an A, but make it 90%. For me a 100% tells me they understood everything and their quiz proves that to me. You’re still the teacher. You still grade the work and you are in charge of making sure their score reflects this comprehension. This kiddo below just joined our class the previous period. He did as much as he could and is welcome to retake it after he gets some more exposure to Spanish. The previous (Spanish 1) class we did a little Calendar Talk a la Tina Hargaden, talking about who likes which days of the week, After we talked plenty, we did a little Write and Discuss, documenting the fascinating things we learned about their classmates. Welp, that’s it! That’s the idea what struck me unexpectedly and I’m super proud of! Thanks for reading and I hope it’s something that will be helpful for you too!! I’ve got lots more to say about assessment, in fact, I’m teaching a session at Comprehensible Online all about Grading smarter, not harder. Want to join this awesome online conference? Use code AnneMarie19 get a $25 discount, expires Feb 28, 2019! Eres una genia! Your timing couldn’t be more perfect. I am working on this issue right now – I am at an independent school and need to show how we grade and I came up with the same thing you guys did. One question – do you have Honors classes? How do you assess placement? Do you mix them with CP kids? Do you give them differentiated work or homework? Thanks for sharing it all! Eres una genia! Your timing couldn’t be more perfect. My admin is asking us to do the same thing. 1. Do you have honors classes? 2. How do you assess for placement? 3. Are they mixed in the same class as CP? 4. How do you differentiate work or homework for the honors kids? Any help in this direction from anyone would be so appreciated! (Meeting on Wednesday). Gracias! We don’t offer honors classes at my school…so I don’t have any experience with that, I’m sorry! Fabulous idea. Thanks so much for sharing! Did you give out the quiz after the video or before? What instructions did you give after you stopped recording? In the long video you’ll see me telling the story, passing out the quiz, explaining how to fill it out and telling the story again. The short video is just for absent students to make it up! Thanks for explaining. Will go back and watch the long video. YAAAAASSSSSS!!!! This is absolutely brilliant and exactly what I needed and have been struggling to do! Thank you thank you thank you! Oh this just tickles me pink! I’m glad you like it! Wow! Thank you so much for sharing! Our school will not move toward grading by proficiency standards any time soon, but I can still use this strategy in my classroom. As a relatively new Spanish teacher, I appreciate your generosity. These are so simple and awesome!! Thanks so much for sharing! Every year (semester, quarter, unit, day…) I remake my rubrics. I have a whole Drive folder called “I love rubrics LOL” because I can’t settle on anything. I am pleased to add this to my collection and may actually USE it since it’s SIMPLE. We are required to keep data on pre/post tests to show student growth so this would be a GREAT way to do that for the listening portion. Thank you so much! Ha! That’s hilarious- I’m honored to be included in your “I love rubrics” folder!! Thank you so much for this resources! I am trying it out today with my 3rd year students. Question: Do you allow students to use cognates in the first section as one of their words/phrases? I don’t teach 3rd year this year but I think it would be OK for them to include cognates. Chances are they’ll fill out section B and A as well, so you won’t even look at C. If they only fill out section C, you’ve got a range for the grade, 70%-79%, so if it’s all cognates you could go to the lower end. Let me know how it works out! This is wonderful! I will be trying it out this week. Thank you sooo much for sharing! Thank you for sharing! These are brilliant and very helpful! Woot!! Thank you for sharing! I’m using this as a listening assessment for the first time. Here’s my question: I have some students in the “A” section that are writing details slightly inaccurately. (Think: He wants to play hockey for New York VS He goes to New York to play.) All five other details are correct. Do you still mark that as a B? Hi Blair. Since you’ve got a range in A (90%-100%) you can adjust accordingly. Maybe if one detail is wrong but still the kid shows comprehension of the details it’s a 96 or 98%… you decide! Do you have a rule that they have to fill out the first section before going to the next section? For example, I don’t think that I explained that well and I had some that filled out all three sections, but left two or three blank on the first and 2nd sections. How could I score this? Aahhh just thought of a question. How do I back these when I have a dept head who says that they should be answering questions in the TL? I think it would be great if my district would adopt something so simple to use but not everyone is on board w/ CI/ TPRS. Thank you so much for sharing your awesome ideas!!!! Well… I’d say if they’re answering in the TL it’s hard to evaluate reading or listening comprehension. You can’t tell if they didn’t understand or if they understood but couldn’t express it in the TL. I think that teachers who are using ACTFL’s proficiency guidelines might be ok with it, not just specifically CI teachers… I know what it’s like when not everyone’s on board! Suerte! So I’m teally struggling with giving kids an 100% or no? If they fill it out completely, you give them 100%? I see so many places that rubrics top grade is a 95% then 85% the 75% Ect… I then feel bad saying “No, you can’t get a 100%.” What are your thoughts? I don’t have a problem with kids earning 100% but they can’t earn it for just filling in all the spaces- it has to demonstrate outstanding comprehension for me. So a kid might have all the A spaces filled in, but that doesn’t necessarily mean an A, if I feel like they are not really specific details and more general main ideas. And you’ve got a whole range to play within A or B so you can adjust it accordingly. I was just coming on to ask you something similar. I used the listening assessment and for the B mark, a student wrote 2-3 sentences, but it didn’t encompass the whole idea. That wouldn’t be a proficient to you then, correct? So if he wrote 2 sentences and didn’t really capture the main idea, I’d still score it as a B, but a low B… 82% maybe? I had a student write details in Spanish not English. I can not accept that- right? It has to be in English so I know they understand? Yeah… I’d prob give it back and ask them to translate what they had written into English. Thank you, thank you, thank you. I am pushing for this in my district. I have fallen in love with competency-based education, proficiency guidelines and UDL. It’s made grading so much simpler! Good luck and happy new year!! Sometimes I am irritated with myself for reading FB as I laze in bed in the morning. Often, doing so leads me on wild goose chases that are not connected with my kids. But today, someone shared these rubrics. I have been trying to figure out how to quiz my new college students (because I have given them wide open CI options as homework instead of assigning a bunch of specific grammar, reading, and listening texts), I didn’t know what I should do. Because of opening up FB this morning, I have a great assessment plan for those students. Thank you so much for sharing! I’ll try to come back and tell you their initial responses. See?!? Sometimes lazing in bed on Facebook pays off!! I did a good amount of that this morning, watching cookie decorating videos… which might never pay off, but opening Facebook is like a box of chocolates- you never know what you’ll get!! I’d love to hear how the quizzes work at the college level! I keep putting them off, but finally explained what the reading and listening quizzes would be like, and we practiced the listening option. There was a sigh of relief. More later! The biggest question my uni kids had was what the difference between the first and third sections. That’s because of the word “phrases” in the first section. I might change it back to “words.” They were all putting in three-word phrases up there. But I explained that, for instance, in the housing description, “three-room apartment” was a phrase, but the fact that the students in the family did their homework in that room was a detail. I love this so so much!!! I used it today, and I was surprised at the good results from my level one students. Yay! I need some help with coming up with the best way to grade these. For example, my students won’t admit they aren’t an “A,” so they all fill it out even if they have erroneous info. So, if they get 3/6 right for an A, are they still an A? Thank you! Your website is so helpful and nice on the eyes! It doesn’t matter if they fill out all sections- the teacher has to verify that they’re correct AND got all the major details. So… maybe a kid fills out all the details, and they’re all right, but he didn’t show he understood the ending, so maybe you score it 95%- it’s still an A but not 100%. As I read, i cross off the incorrect details or add “why” to a detail, if it’s not specific enough. (“The girl is sad “ does not count as a specific detail. “The girl is sad because she failed her math test” counts). Then ask yourself how much did he understand? 3/6 correct could be an A- if a B+, depending on how well he convinced you that he understood. Is that helpful?